Have you ever wondered what Remy puts in the soup that Linguini nearly ruins in Ratatouille? Of course you have! We all have. Well, here in the test kitchens of The Ordinary, we’ve done exhaustive research to arrive at the definitive version of the soup, with the precise ingredients that Remy used. Precisely definitive! We watched this scene dozens of times. We’ve listened to characters’ descriptions of the soup, and we’ve analyzed the inner workings of the kitchen to arrive at a soup that is a “spicy yet subtle taste experience.” Let us walk you through it. To begin with, when Linguini nearly knocks the pot off the stove, the soup looks like tomato sauce. We determined, decidedly, that it’s probably some sort of tomato soup. We kept that part simple, but we did add a spicy element, because nothing we saw Remy add could be described as “spicy.” Linguini adds tap water, an entire bunch of scallions, white wine, and salt, lots of salt. Noted. Remy adds broth, cream, garlic, thyme, black pepper, cubes of potato, leeks, parsley, chervil, more salt, bay leaves and, we believe, basil. He later states, when questioned by Linguini, that he DID NOT add oregano or rosemary, which they both identify as “spices,” although we, here at The Ordinary, would call them “herbs.” The soup turned out delicious! Spicy, yet subtle. My son, something of a Ratatouille scholar himself, ate three bowls, but declared that the color was too rosy. I’m not an imaginary french rat, for heaven’s sake! I’m not actually going to add an entire container of cream! Here’s Souped Up from the Ratatouille soundtrack to listen to as you leap over the pot, gleefully adding ingredients. Warm the olive oil and butter over medium heat in a large soup pot. Add the thyme, basil, bay leaves, red pepper flakes, shallot and garlic. Cook for a few minutes, until things start to brown, and then add the scallions, potatoes, leeks. Cook until the potatoes start to brown a bit on the edges, and until they seem a bit soft. Add the white wine, and cook until it’s reduced and syrupy. Add the tomatoes, thyme, veg broth and a teaspoon of salt. Bring to a boil, then reduce heat and simmer about 20 minutes to half an hour, till the potatoes seem soft. Add the parsley and cream. Cook to warm everything through. Add the chervil right at the end – it’s very delicate. Taste for salt and pepper. Serve! 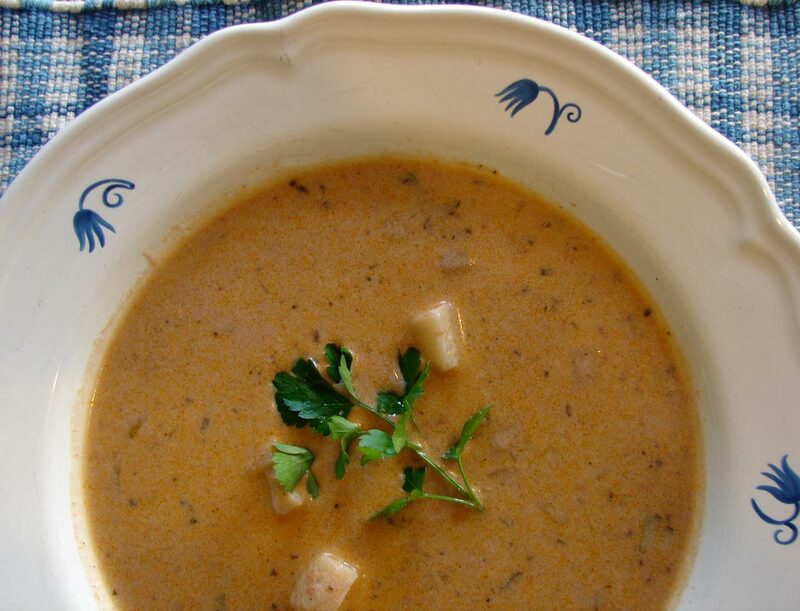 This entry was posted in potatoes, recipe, soup, tomatoes, Uncategorized and tagged leeks, parsley, potatoes, ratatouille movie, remy's soup in ratatouille, spicy leek and potato soup, tomato cream soup, tomatoes by Claire. Bookmark the permalink. Great post Claire! Love that movie! One of the best food movies ever made. I loved your comment about when Ego tastes the ratatouille in the film in an earlier post. My favorite scene. We’ll be showing a food movie at the Acme soon called “Jiru Dreams of Sushi”. Check out the trailer! Hello, Jane! I’ve read a lot about Jiru Dreams of Sushi. It sounds wonderful! I really love your recipes and was wondering if you had tried to recreate remy’s chanterelle mushroom with tomme de chevre de pays creation? I don’t…yet. It does look delicious, though. I’m not sure how to recreate the lightning-y part without actually getting electrocuted! I’ll work on it and let you know. I hope it works out for you! I love ratatouille, too. We just watched it again because it was my birthday and I insisted on it! The soup turned out great! Although the appearance is a bit different from the movies, it tastes exactly what you think it would when they speak of it in Ratatouille! Will be making it very soon again. I’m glad it worked out for you! I agree about the appearance–my sons commented on it as well, but I think you’d have to add about a quart of cream to make it look like it does in the movie!! I’ve been wanting fo maks his soup for years. Thanks for making it posible now!! Just a quick question: when you say “one can tomato puree”, how big a can do you mean? It’s a 14.5 oz can. I’ll fix that in the recipe! I used fire-roasted diced tomatoes, and puréed them before I put them in. Pingback: Popcorn | Life. Love. And Food. Glorious food. Hmm… I’m not quite sure what I think. I wish I liked the movie, but really? Come on! Rats cooking! Even if this did happen NOBODY would eat it. I mean, would you? I think not. The soup was good, I guess, but it’s just a soup! It’s not like Ratatouille himself made it. Oh my gosh! So sorry! My little brother logged on and wrote that. I don’t know why he hates Ratatouille so much. Well, anyway, sorry about that again. Lol. Funny! He does have a point…I’ve worked in too many restaurants not to be a little squeamish at the sight of a kitchen full of rats. I’m glad the recipe worked out for you. Thanks for leaving a comment. I’m a writer for BuzzFeed Life working on a post featuring ways to prepare foods seen in Disney movies and I was wondering if I could include an image of your soup in the post. You’d be credited and I’d link back to this original post. Would that be OK? Just let me know and thank you so much for your time! Of course! I’d be honored. Let me know if you need anything else. By far the best soup I’ve ever made! Substituted the cream for coconut milk and used half a can of tomato purée. It was so good, I ate it for breakfast this morning! I’m glad you liked it. Coconut milk is a genius idea. I’m going to try it that way, too. Thanks so much for taking the time to leave a kind comment. Just watched Ratatouille again and the soup always makes my stomach rumble. I’m going to cook this! This was insanely good and so fun to make while we watched the movie as a family. It was a little too spicy for me, so I would reduce the red pepper flakes next time (but I’m also a wimp. 😉) Thanks so much for sharing, we will definitely make this again! Great recipe! I loved it so much! It is indeed “Spicy, yet subtle”! I have 5 foster sisters, and we have a “Foreign Food Friday” every week where we watch a movie related to a culture and eat that culture’s food. This week was France, we watched Ratatoullie and ate this soup, Ratatoullie, bread, and various cheeses and grapes. This was the heavy favorite, and my family is very picky. I was told that this was “the best soup ever tasted” (by my EXTREMELY picky sister). This is an excellent recipe. Thanks so much for letting me know. I’m glad it worked out for you.